The WW restaurant points tables on this site have interactive features making it easier for you to find what you are looking for. Below are some helpful tips on how to use this format and help on how to search, filter and more. If you are already familar with the tables, and know how to search and filter, and are ready to browse the list, just head over to the restaurants page now to find your favorite stomping grounds. If this is your first visit or you want to know how to use the table features, stay right here. Scroll down to take a look at the tips below (complete with screen shots) and then go on over to your favorite restaurant page to find the WW points for your favorite menu items. Below outlines the various interactive features of the table. You can use them all or just the ones you find useful. The WW restaurant points table will default to showing all menu groups with a display of only 25 items. Menu items are sorted in alphabetic order. In addition to the interactive features there is an information area that is also explained below. 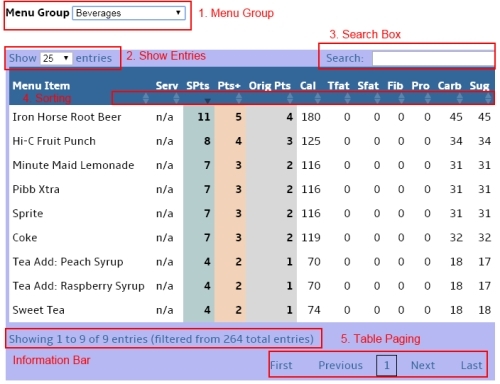 Menu Group, Show Entries, Search Box, Sorting and Table Paging. Each time you use one of the interactive features, the information bar is also updated. This information area will explain what entries are showing based on what feature you have used. 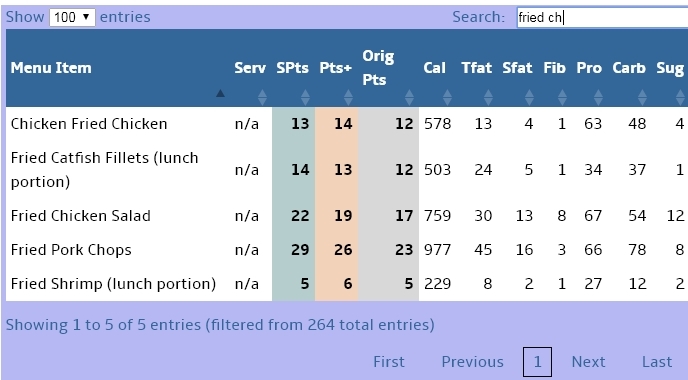 In the above screen shot, the WW restaurant points table is displaying 25 items out of a total of 264 entries. As each of the interactive features are explained below, the change in the information bar is also explained. Each restaurant page has it's own unique set of menu groups based on their menu. If you are looking for points for a particular area or item, you can use the drop down selection list to narrow down the table. By default all menu groups are shown when you first enter that WW restaurant points table. Just click on the down arrow to open up the selection list. This list is sorted alphabetically by the specified menu groups for that restaurant. Once a menu group is selected, only those items within that group will be displayed. You will see that the menu group now shows the selected group and not "All" entries. You will also notice that the table is filtered from the original entries. This is seen by looking at the bottom of the table in the information bar. To return to all menu items, simply select "All" from the menu group drop down box. You can also select another menu group to browse their menu. As mentioned above, the table will display only 25 records at a time by default. This means when you first enter the WW restaurant points page, only 25 records are displayed in the current table view. You can easily display more entries at a time or choose to display all menu items. Simply use the "Show Entries" drop down selection list. You can choose 25, 50, 100 or all entries from the selection list. Once you have selected the number or items, the WW restaurant points table is automatically refreshed to show the number of entries based on your selection. You will see the information below the table change to show that more entries are displayed at one time based on your selection. This is one of the most helpful features especially if you are not sure what menu group the item is in. Instead of scrolling through the entire table, you can type in a specific (or partial) search term. As you type, the WW restaurant points table is automatically filtered to only display items that contain your search term. As you can see in this screen shot, the search term "fried ch" was used keeping the menu group as "All". Based on this search term with the "All" menu group, 5 items were found. There are 2 items that belong to the "Favorites" menu group, 2 items in "Fish & Seafood) and 1 item in "Salads" The search box works with other interactive features of the WW restaurant points table. So if you had selected the "Salads" menu group first, then typed in "Fried ch", only the 1 item within that menu group would be displayed. In addition, the search term feature looks for all items that "contain" that search term. For example, the Fried Catfish Fillets (lunch portion) showing on the list has the Fried and the "ch" (in lunch) so it was shown on the list. This smart search feature means you can find an item even if it doesn't start with the search term you entered. The nice thing about this, is that you don't have to have an exact match in order for it to find the menu item. It just has to contain the search term somewhere in the name. You will notice that the information bar has also changed to show only 5 of 5 entries (filtered from 264 items). If your list is still too long, simply be more specific in your search. For example, if you had typed in "fried chicken" instead of just "fried ch", then only typed in bacon cheese, only menu items with both "fried" and "chicken" would display in the list. The most important thing to remember when using the search term is to be aware of what menu group is currently selected. If "Beverages" are selected and you search for "bacon", more than likely nothing would be found. To clear your current search simply clear the words out of the search box and hit enter. This will refresh the table and show all entries for the currently selected menu group. This feature is great for finding the lowest (or highest) Weight Watchers Points, calories or whatever nutrition value you are interested in. The WW restaurant points table can quickly be sorted in ascending or descending order by any of the columns in the table. The table will default to sort by menu item in alphabetical order. To sort in ascending or descending order by your chosen column, just click the appropriate arrow button. Click the "up" arrow for ascending and the down arrow for descending. You can also just click on the appropriate column heading to sort ascending. Click again to change to descending sort. You can tell the current sort as that arrow will be highlighted (darker than the others). In the below screen shot example, the SmartPoints column was clicked to sort ascending. As you can see the menu items are now sorted differently than from the screen shot above. The items are now sorted by the lowest SmartPoints first. If you are trying to find an item with the lowest points to stay within your daily allowance, this would be a quick and easy way to see what you can order. Of course, if the "All" menu group is selected, then you will see sides, beverages, entrees, etc. So it may be useful to first select a menu group like "Breakfast", "Entrees", etc. before sorting. When the table is filtered (either by selecting a menu group or using a search term), only the filtered items will be re-sorted based on the column you selected. If you want to sort by the highest values, then just click again on the same column heading. This will change the WW restaurant points table to be sorted in descending order as shown below. This will change the WW restaurant points table to be sorted in descending order showing those menu items with the highest SmartPoints. By the looks of these menu items, I won't be ordering the BBQ Pork Nachos. This can be useful to know which menu items to stay away from if you are close to your daily and weekly allowance. This is also useful for those people trying to watch their intake of saturated fats, sugars or even carbohydrates. Since the sort feature only sorts the existing records, the information bar at the bottom will not change (unless you have applied a filter by selecting menu group or using the search box). Since the table will first be displayed with only 25 items showing, there is a paging feature that you can use to scroll through the entire table. This paging is shown at the bottom of the table. To scroll through the table, simply select the "next" button or use the page number buttons on the bottom. As you scroll through, the current page you are on will be boxed so you know where you are at. In the screen shot example below, you can see that it is showing that you are on page 2. You can always go back to the first page quickly by either clicking on the "1" or click on the "First" button. In addition, the information bar is updated to show you are viewing 26 to 31 items of 31 entries in the table that has been filtered from a total of 264 menu items. 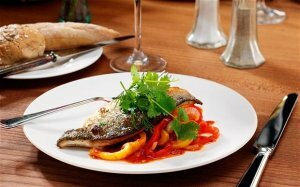 Hopefully this page helps you find your favorite menu items and the Weight Watchers Points or nutrition information associated with that restaurant. If you are ready to get interactive, then go to the WW restaurant points page. If you are thinking about taking your weight loss to a free styling method, then check out this article. Learn what's new, what's changed and what stayed the same. Start your day out right with some healthy food on the table. Some have low SmartPoints as they use zero points ingredients. Ever wonder how many points are in your alcoholic beverages? Read this article to find a way to quickly calculate the points plus value.